A traveller in 1822 Britain relied on this very copy of Paterson’s Roads for a milestone by milestone guide along any one of England’s roads. It was updated by Edward Mogg whose foreword reads “To His most Gracious Majesty The King, Sire, Permitted to lay at Your Majesty’s feet this humble tribute of grateful respect, I can only regret my inability to render it as deserving Your Majesty’s patronage”. Unfortunately this traveller would not have been able to identify the butterflies they saw on their route as Morris’ Guide to Butterflies was not available until 1860. Perhaps though, 1820’s England was not yet conducive to the entomologist as it was to the Victorians who used this copy of Morris’ guide. James Greenwood shares his journeys through London in his book published in 1873 and by 1984 armchair travel could be had around the world courtesy of Rev. Francis E. Clark and his wife Harriet (who is allocated a mere 30 pages for ‘a woman’s view’ at the end of a 600 page tome. In ‘Other Worlds Than Ours’ in 1898, Richard Procotor B.A. F.R.A.S. speculates, with typical Victorian wordiness, that life on Mars is far more likely than not. He may yet prove to be right. But so exciting to hold a book from an era when the possibility of reaching the moon was not yet entertained and leaving the ground for more than a moment was almost unheard of. The Handbook of Travel produced by Harvard University Press in 1935 includes advice on aeroplanes and automobiles versus llamas and pack-horses for transport, as well as advice on field surgery and elephant shooting. Hints to Travellers, of the same year, provides detailed gidance on field astronomy and surveying for the amateur planning to map the few remaining unexplored lands. And by 1941 in the midst of WWII, this Steimazky’s guide helped a traveler plan their trip and find food, accommodation and places of interest in Palestine. 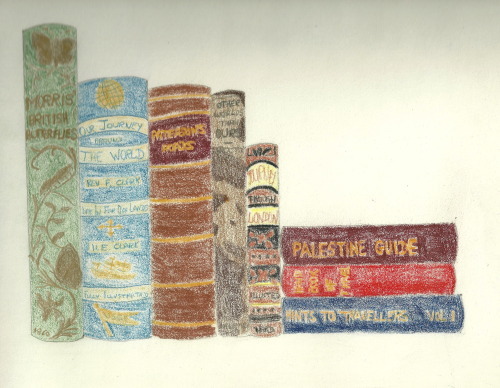 My Ideal Bookshelf is real and evokes a time when travel was a true adventure, lands remained unexplored and reaching the moon was a distant dream for future generations.